The unholy sword was sealed by the destined one, but a mysterious individual revives the azure knight, Nightmare. The legendary battle of Soul Calibur and Soul Edge moves to the next phase. Which sword will ultimately prevail? What is the motivation of the three new souls who join the fray? And how will you, the player, become involved in the world of SOULCALIBUR? The king of fighters is back and once again Namco show the world why they are the number one in fighting games but at what price did the developers make in converting this title from the arcade to the PlayStation 2? 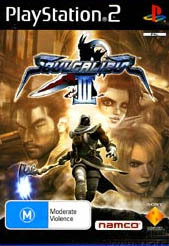 Unlike other fighter games, Soul Calibur III returns players to the traditional Soul Calibur universe where players must use whatever it takes to win their battles, whether through fists, kicks or weapons. Boasting a variety of gameplay options and multiplayer fights, Soul Calibur III may sound like the next best thing but unfortunately it seems a step back from the previous game. Needless to say, Soul Calibur II was easily one of the most original and unique fighting games available that really set the benchmark of this genre. Unfortunately this current incarnation, although graphically superior has limited the freedom of the arenas that also slightly hampers the gameplay of this title, making it difficult in distancing yourself from your enemy. It almost feels closterphobic. 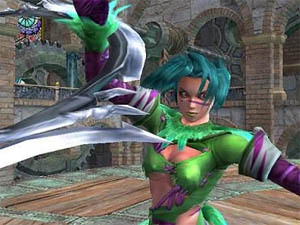 The gameplay of Soul Calibur III is similar to the previous game where players must fight their way through a variety of characters, until they can finally hold the legendary Soul Calibur. You can also unlock a variety of different items and also customise your characters through editing the colour palette. The game also features a variety of different gameplay modes with storymode being the most entertaining aspect of the title that tells a tale of the character you are fighting with a final boss battle at the end. 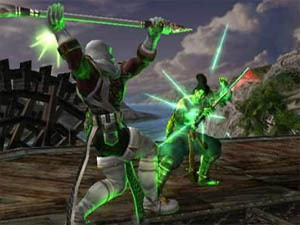 Graphically, Soul Calibur III although an impressive looking fighter is starting to show the age of the PlayStation 2. The characters have all been professionally designed that contain some extraordinary texture detail with some impressive looking gaming environments but unfortunately the machine suffers from various slowdown issues. Although this doesn't hamper the gameplay too much, it does make you notice this flaw but fortunately the special effects in the game almost make up for this sin with motion blur, fog effects and realistic lighting. The sound effects and musical score of Soul Calibur III has been professionally implemented and really helps immerse you into the Soul Calibur universe with its engaging music and realistic sound effects. I must admit that the soundtrack brings back good memories of Soul Calibur II. In conclusion, Soul Calibur III is an entertaining fighter game that unfortunately comes with a little too many bugs from graphical glitches to gameplay flaws that the average gamer will probably not notice. However, if you're looking for a fighting game with a little more intensity than you might want to check something else out. Worth a rent before a buy!